Last week my daughter, and my grandchildren and I went blackberry picking. A ferry ride away from Seattle is a small town called Bainbridge Island. The island is filled with wild blackberry bushes and August is the best month to pick berries. We ended up with a whole lot of berries, and even after eating a big bowlful, we had plenty left over for a blackberry pie. My grandson Jayden is almost eight, and he loves cooking in the kitchen. 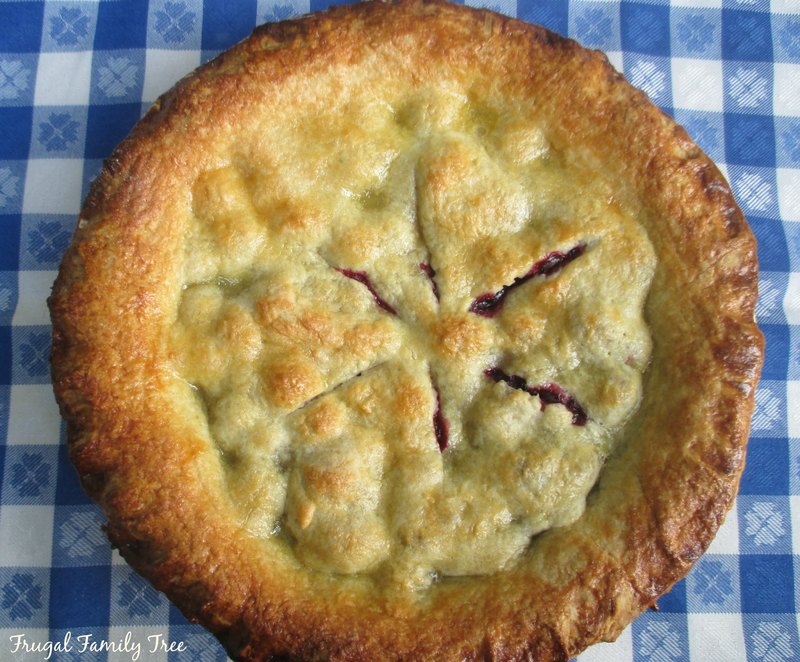 He helped out so much in making this pie, from stirring the berries in the sugar, rolling out pie dough, and even brushed on the egg wash. I love sharing this time with him, and I know he'll remember the day that he and Nana made a pie together. Cooking with children not only teaches them how to cook, but builds memories that last a lifetime. I look forward to making many, many more pies with him in the years to come. Picking berries is so much fun, and you can't get any fresher that just picked off the bush. 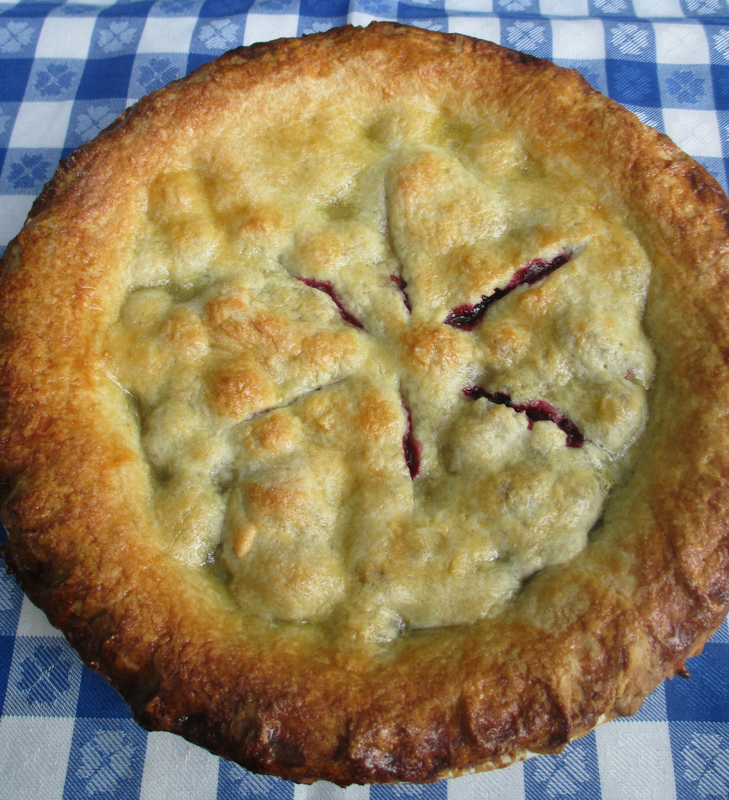 The recipe that I used for the pie dough is the same one I use to make a fruit galette, but it's doubled. This is absolutely the best dough recipe I have ever found, and it always comes out flakey and delicious. Even after we handled the dough much more than if I had made the pie alone, the crust was still so, so good. Press together with lightly floured hands, and form into a flat round. Cover with plastic wrap, and place in refrigerator for at least 1 hour. Lightly spray a pie plate with baking spray. To make the egg wash, mix together 1 egg and 1 tablespoon milk, set aside. Divide dough in half. On a lightly floured surface, roll out 1 piece of dough into a circle, about 10 inches round. Fit into pie plate, Roll out the second piece into another round, set aside. To make the filling, in a large bowl combine berries, sugar and 1/2 flour. Stir gently to combine. Spoon the fruit mixture into the unbaked pie shell, cover with top crust. Seal and crimp the edges, then make small cuts in the top crust to make vents for the steam to escape. Brush the top with the egg wash, then sprinkle with 2 tablespoons sugar. Bake for 50-55 minutes, and until top is golden brown.